Seven Arrows Art Gallery is a privately-owned shop that proudly features authentic artwork, hand crafted products, and genuine artifacts from Native American artisans across North America. The cozy wooden shop is located in historic Woodstock, GA, in the midst of this newly revitalized heart of the town. Surrounded by abundant parking and bustling shopping and restaurants, Seven Arrows Art Gallery is conveniently located at 8582 Main Street, and is open 10am to 5pm Monday through Saturday. Some signature items also offered in the gallery are shadowboxes, fishing hooks, and bone-crafted sewing needles crafted by renowned Comanche craftsman Jerry Ward. 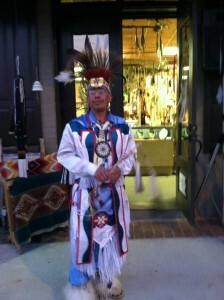 Seven Arrows Art Gallery finds their treasures from many different tribes. The gallery offers items from the tribes listed, that are unique to their own traditions, handed down through generations. Whether you are in the market for some turquoise jewelry to make a fashion statement, or for some Pueblo pottery for home décor, Seven Arrows Art Gallery is the place to visit for authentic products and exceptional customer service!